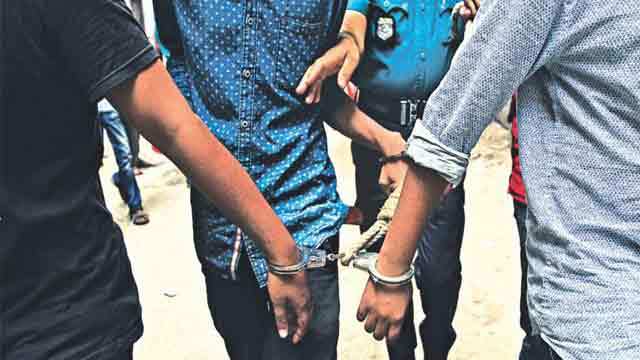 Dhaka, Aug 15 (Just News): Until now, 51 cases have been filed in capital Dhaka and 97 people arrested in a massive crackdown since the student protests in Dhaka demanding safe roads. Dhaka Metropolitan Police (DMP) made the information public today, saying the arrestees all had helped roll rumours on social media, thereby instigating protests. Among these cases, 81 were arrested in 43 cases filed under penal code and Special Power Act, said Masudur Rahman, deputy commissioner (media) of DMP. Since then, students took to the streets for eight days in a row – besieging the capital and blockading the streets for hours – before things rolled over to violence in the end. Among them are 22 students of private universities, internationally famed photographer Shahidul Alam, and a local actress Qazi Nawshaba Ahmed – all behind bars. Among those arrestees, 81 were arrested in connection with 43 cases filed under section of Panel Code and Special Power Act, the DC (Media) said adding that 16 others were arrested in connection with eight cases filed under ICT Act with different police stations during the time. Special super (SS) of the CID (Organised Crime unit) Mollah Nazrul Islam told UNB that a case was filed with Paltan police station under Section of 57 (2) of the ICT Act on 15 August (Wednesday) against two students whom they arrested from East Rajabazar and Kamrangichar in the capital on 14 August night on charge of spreading rumours on social media during the recent students' protest for road safety. Sources at the DMP said a total of 14 cases were filed with different police stations under Ramna division and 31 people were arrested in connection with the cases. One case was filed with a police station under Lalbagh division of the DMP and one person was arrested in connection with the case. One person was arrested in connection with another case filed with a police station under Wari division, while 10 people were arrested in connection with six cases filed with different police stations under Motijheel division of the DMP. Six people were arrested in connection with two cases filed with different police stations under Tejgaon division, while five cases were filed with different police stations under Mirpur division. Besides, nine cases were filed with different police stations under Gulshan division and 26 were shown arrested in connection with those cases. Three people were arrested in connection with four cases filed with different police stations under Uttara division. It is to be noted though, local international calls have been placed to the government for stopping arbitrary arrests and releasing the detainees – all of which were unheeded. The arrest of photographer Shahidul Alam drew the most condemnation, most widely from the international quarters. All of them urged to release the famed individual.